Almost 4000 square feet 4 bed room 3 full baths. Located On Main Street Historic Building built 1850 huge apartment for large family or friends. Overlooking Main Street property survived the Civil War has a cannon ball hit on the front brick facade. Property has full kitchen and 3 full baths lot of upgrades yet retaining the period structure. Walking distance to shops food the Appomattox River and The High Bridge Trail. As the owners we are trying to save this Historic Building and give it a useful life for many years to come. Dianne and Nathan Bozarth bought Poplar Hall in 2007 and began shortly after on the rehab. The original building was constructed around 1850 the building survived the Civil War with only a single cannon ball hit between the windows on the 2nd floor. The building has been rumored to have the honor to have both Lee and Grant visit the building. We bought this building to save a piece of history and has been restored with few as possible alterations. Walking distance to most shops and restaurants on Main Street free public parking across the street by railroad car. Located on 2nd floor must walk up stairs. It was big, roomy and comfortable. Every amenity needed was provided. Thank you. Thanks for staying with us at Poplar Hall. Thouroughly enjoyed our stay at Poplar Hall! 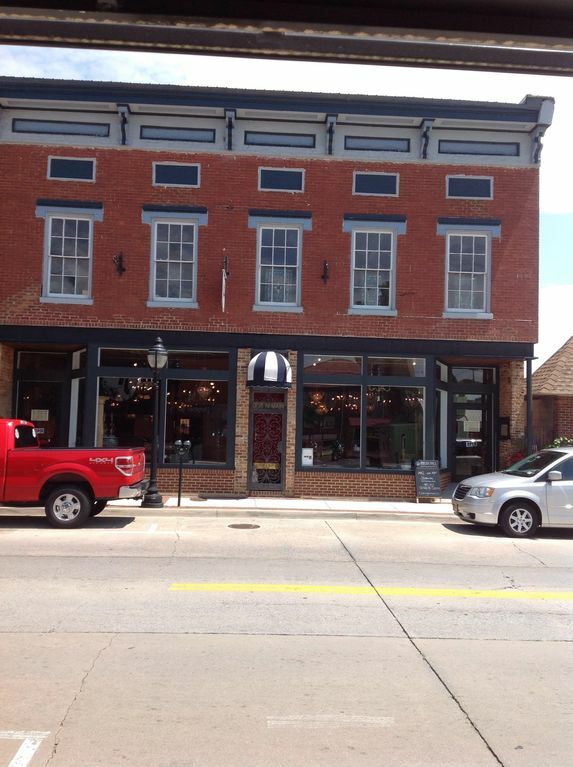 The condo is right above the antique shop in a perfect location on Main Street. Breakfast, dinner and shopping are within walking distance. It is very eclectically furnished which creates a welcoming and comfortable environment. We had a party of six, but with the addition of its 4 cots, you can easily sleep 10 and still enjoy privacy. The only drawback is the steep stairway - doable, but not ideal for elderly/disabled persons. Forget hotels! Book this property ahead of time for Longwood University or Hampden Sydney College graduations! Having never personnally stayed at a VRBO place myself I'd have loved to have instructions or requests from owner. I wasn't sure of normal protocal. Loved the location and the apartment! Located 100ft from the Hugh Bridge Trail 1/4 mile from the Appomattox River.